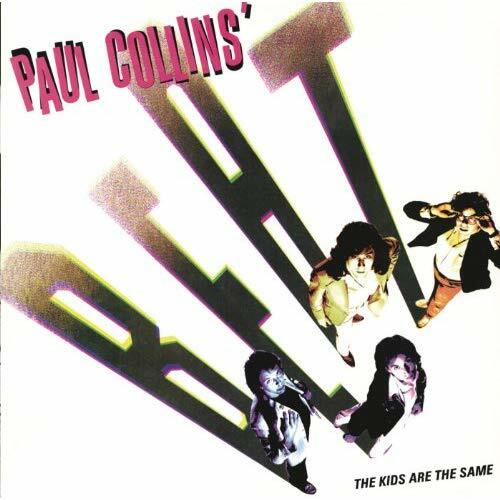 By the fashion of the time, it took quite a long time for Paul Collins and company to follow up on The Beat, as The Kids Are The Same didn’t come out until 1982, this time fully credited to Paul Collins Beat, as by that time, both I Just Can’t Stop It and Wha’ppen had both come out on these shores. The difference between the two albums is mostly signified by the track lengths: on The Beat, 9 out of the 12 songs were under 3:00, signifying that album’s focus on catchy power-pop. On The Kids Are The Same only 3 out of the 10 songs were under 3:00, because Paul Collins had decided to expand his music, make it more than just snappy power pop tunes. It made sense: a second album that was a carbon copy of the first might have seemed redundant. And indeed, when the awesome opening track “That’s What Life Is All All About” came out of the gate rumbling on top of a bed of acoustic guitars, the differences between the two records were instantly made apparent. Nevertheless, The Kids Are The Same didn’t quite hit me in the same way as The Beat, even though the highs were even higher. But there was also a song I disliked so much at the time, I’d totally forgotten its existence until I started writing this post. That song is called “On The Highway” and was — of course — a pretty big radio hit. It was also 5:46 that just didn’t do it for me, and pretty much killed side one of The Kids Are The Same for me. Luckily, side two started off with the title track, a rousing teenage wasteland anthem with guitars and bass roaring and drums slamming, as Collins writes from the perspective of anyteen U.S.A.
And each verse is backed up by an utterly soaring call-and-response chorus. In other words, the kids are alright! And the ripe old age of nineteen, I didn’t really treat “The Kids Are The Same” as any kind of personal anthem or manifesto or anything like that — though I did enjoy Collins’ neat trick of switching up the pronouns from “them” and “they” to “us” and “we” at the end of each of those choruses — but what I did treat it as was a song that had a a chorus for the ages. Which was even more important. I also enjoyed the near-cheesiness of the listing of all of the places where the kids were the same — including Russia and China, even — no doubt earning cheers when in those cities when that song was played live. Or even better, when he substituted your city in that list when playing the song live. And while I don’t have any specific memory of it, I’ll betcha dollars to donuts that at some point during that listing when The Beat played the Star Palace in 1983, he tossed in a “here in Fresno!” to a round of cheers. In any event, “The Kids Are The Same” is an absolutely dynamite song that should have been a massive hit single, and it’s not even the best song on the album.